If you’re looking to upgrade your range or cooktop, you may be finding yourself in a bit of a dilemma right about now: Do you stick with a four-burner, add a fifth-burner, or splurge for the six-burner one? While the number of burners on a stove have their benefits, a lot depends on the way you cook and the sizes of the pots and pans you have. For instance, are you someone who likes to cook a variety of dishes at a time, or do you use less than three burners and cook other recipes in your oven simultaneously? Is your family – and dining room table – expanding, or are you primarily preparing dishes for just you and your loved one? These are all good questions to ask yourself before committing to a new stove or cooktop. A five-burner cooking stove tends to have a different design than most range tops, so the types of cooking pots you use on a daily basis should be taken into account. A five-burner range typically has four burners placed in a square, with the fifth burner either in the center or along the back of the range top. The fifth burner is generally oblong-shaped, making it perfect for various cooking containers, such as stock pots. A five-burner range with a single oblique burner is great for those who do not have a large kitchen space, but still love to cook. A bonus with five-burner ranges is that they allow for a lot of flexibility in cooking, so you can boil water, heat up a casserole and simmer sauce all at once. Because of their design, five-burner ranges are able to accommodate all different pan sizes, making it a smart choice for the adventurous chef. Two popular choices for a 30 inch range with five sealed burners are the Bosch HGS5L53UC and the LG LDG3035SW. If you have a roomy kitchen and actively cook for large groups, then a six-burner rangetop stove may be the right choice for you. These stoves tend to be a bit larger, so they work best when you have the space. Busy parents who need to cook large quantities at once may find it easier to do so on a six-burner rangetop, which has six burners symmetrically lined up in a rectangular pattern. The Fisher Paykel OR36SDBGX2 is a popular example of good design and cooking efficiency. The placement and shape of these burners allow dishes to be cooked evenly, so you never have to wait around for one to finish. Many models, such as the Frigidaire FPEF4085KF 40″ Freestanding Electric Range, let you combine two burners into one, creating a heating element that’s perfect for large cookware. While they may be large, stoves with a six-burner range provide you with a high-functional kitchen and a way for you to get things done in the shortest amount of time. 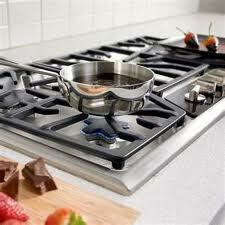 Before purchasing a new stove, you should also consider some other factors, such as the make and finish of the cooktop. For instance, what type of cooking surface? Electric, gas or induction? If you would like a hybrid – gas and electric burners — do you have the correct hook-up available? You may find that aesthetic wins out over functionality and opt for a ceramic or smooth glass cooktop instead. Glass and ceramic surfaces are easy to clean and they instantly provide kitchens with a chic look. Also, the color of the stove may impact your decision. Black finishes are less likely to show stains, and will also blend in nicely with darker kitchens. Our advice is to measure your space first since standard cooktop and ranges are 30, 36, 48 and 60 inches wide. Think about the type of range (gas, electric or induction), then think about how you cook and what makes sense as far as the size of your existing pots and pans. For instance, a paella pan is designed to reach over the largest burner whereas a griddle plate is designed in a rectangular shape to fit back-to-front over two burners. We’ve never had a customer regret choosing a five burner over a traditional four burner and customers with room in their kitchen are very happy with a six or eight burner option.